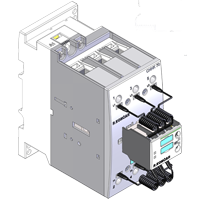 Range of capacitor duty contactors are equipment with early - make contacts. This special type of contact performs the function of connecting for a very brief interval, 2-3 ms, during the contactor closing, resistances which limit the connecting current of the capacitors. These resistances are then excluded when the closing operation is complete and the current capacity is conveyed to the main contacts. The range starts from models suitable from 5kVAR upto 75kVAR step size switching.